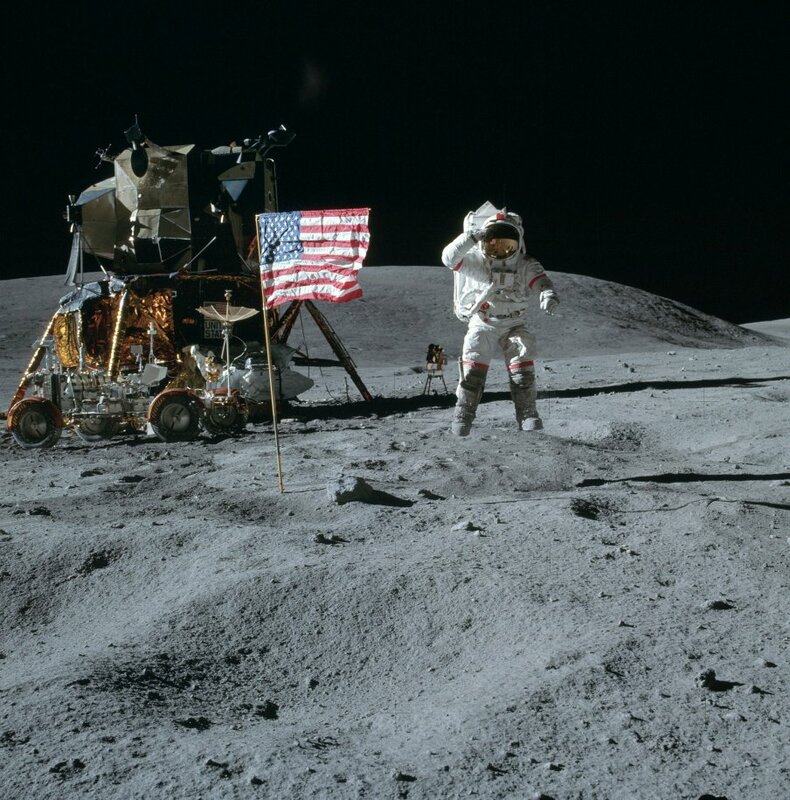 One of the more enduring questions about the Apollo Moon missions is seemingly simple: after 40+ years, are the flags the astronauts planted on the lunar surface still there? It’s an interesting question. Buzz Aldrin claims he saw the flag blow over when the ascent module carrying him and Neil Armstrong lifted off from the Moon – which was never confirmed (until now; hang on for that), but the fates of the flags from the other five missions have never been ascertained. In 2009 there was tantalizing evidence the flags from Apollo 17 was still standing, but the images were just barely too fuzzy to know for sure. But now, apparently, we do know: the Lunar Reconnaissance Orbiter has now confirmed that the flags at all the landing sites are still there, except for Apollo 11. It looked like Buzz was right! The flag itself is visible in the picture – LRO’s angle on it shows the shadowed side, which is slightly darker than the lunar surface – and the shadow it casts on the surface is obvious. I also like it because it debunks a particularly silly Moon hoax claim (you know, the folks who think, despite a space program’s worth of evidence, that the Apollo missions were faked). One big claim is that the flag is waving in some pictures. It’s a particularly goofy claim, since you can’t tell if a flag is waving in a still photo! 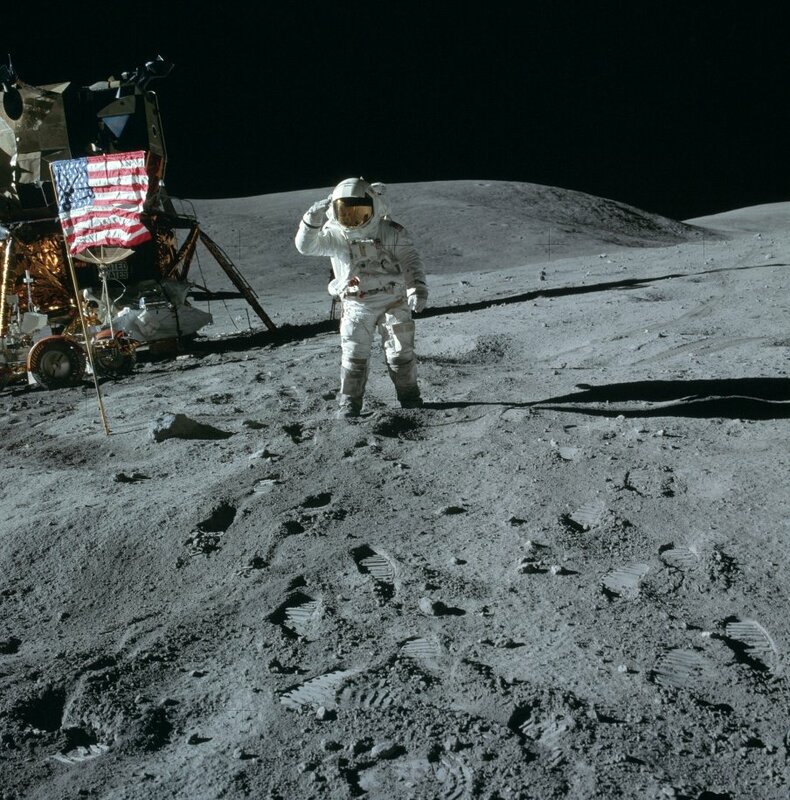 But during Apollo 16 Duke took a picture while Young saluted the flag, and Young took a picture of Duke saluting it. The pictures were taken half a minute or so apart, but if you compare them (here and here) you can see the flag has not moved one iota. Even thought he angles in the pictures are slightly different, it’s clear the flag is very, very still, just as you’d expect on an airless body like the Moon. But those hoax claims are fantasy, and these new images are reality. We can see the flags now, still standing after more than four decades. That gives me hope that sometime in the near future – hopefully less than 40 more years from now! – someone will be standing there once again, and take a picture of one of those flags starkly contrasted against the dark black sky over the lunar surface. What a sight that will be. 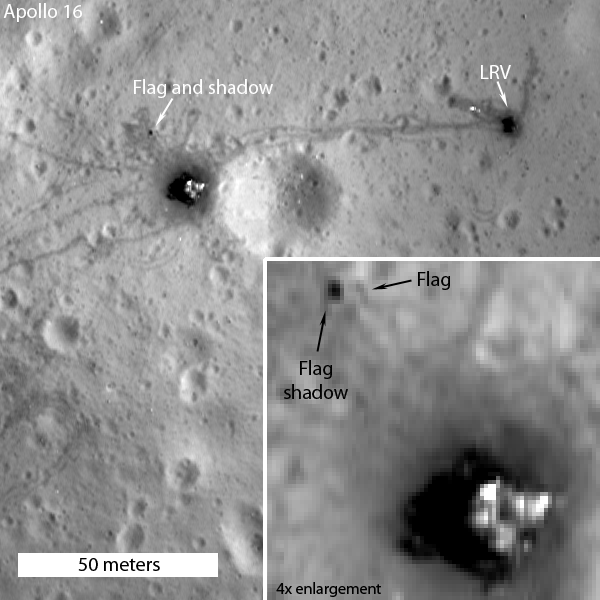 * I’ll note that the LRO page (linked in the article above) says that early in the LRO mission the flag’s shadow was seen from Apollo 12. I didn’t know that! So that’s pretty cool.